Dr Clare will be going through herbs that heal/soothe/support persistent coughs, pulmonary conditions, sinusitis, rhinitis all to do with chest and sinus conditions. Dried herbs, tinctures, creams and capsules to help will be discussed in detail. Her background in Family Medicine combined with her Clinical and Academic Credentials in Herbal Medicine mean that you are assured of the highest level of medical care. Dr Clare has graduated from University College Dublin Medical School (MBBCh, DRCOG) and from Middlesex University BSc(Hons) Herbal Medicine. She has been in full time Integrated Medical Care since 1999. She is also an Honorary Clinical Fellow at National University Galway, College of Medicine. 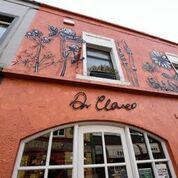 The clinical team at Dr Clare Apothecary offer the highest levels of training in the various disciplines of natural medical care. Our approach is always to integrate natural healing with any necessary pharmaceutical treatments. Working closely with Nutritional Therapists on site, there is a natural symbiosis with Herbal Medicine and Nutrition support. Date: Wednesday January 30th 2019. Cost: This webinar is free of charge. Webinar: Approximately 45 minutes with Q&A at the end. PLEASE NOTE YOU NEED TO SET YOUR OWN REMINDER. YOU MUST HAVE ZOOM ON YOUR DEVICE TO PARTICIPATE. PLEASE ALLOW TIME TO SET UP.